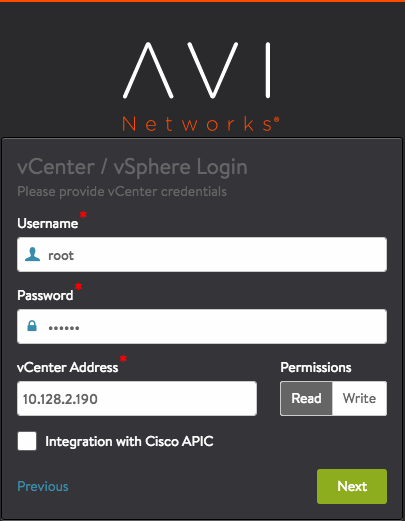 This guide describes how to integrate Avi Vantage into a VMware vCenter cloud. 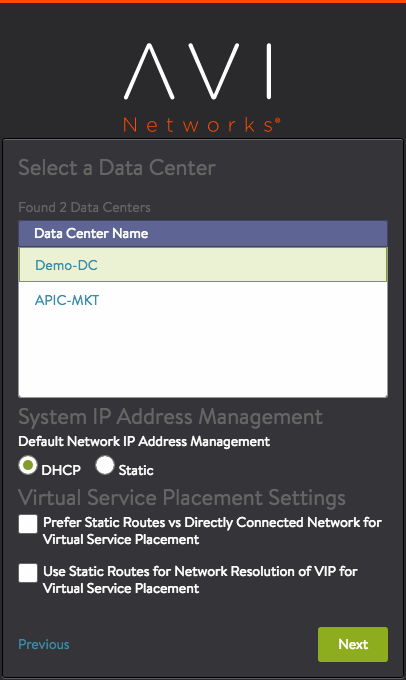 A single Avi Controller cluster can support multiple concurrent vCenter clouds. Deployment in write access mode is recommended. 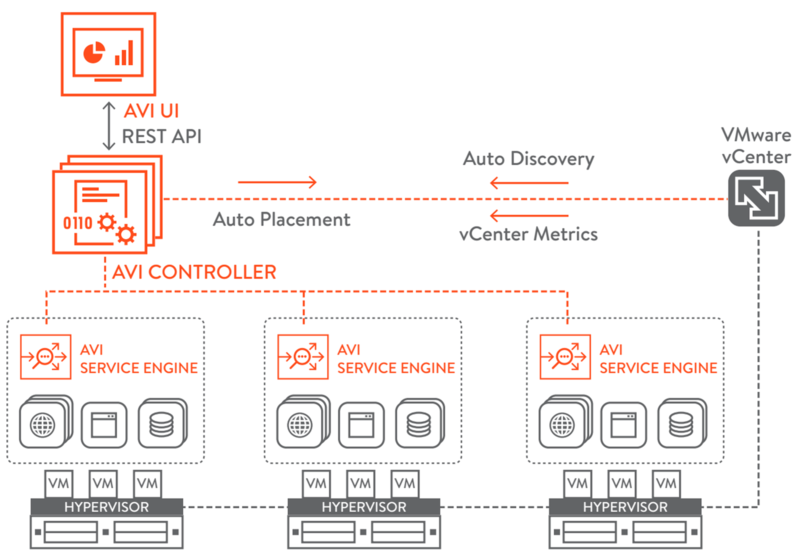 It’s the quickest and easiest way to deploy and offers the highest levels of automation between Avi Vantage and vCenter. 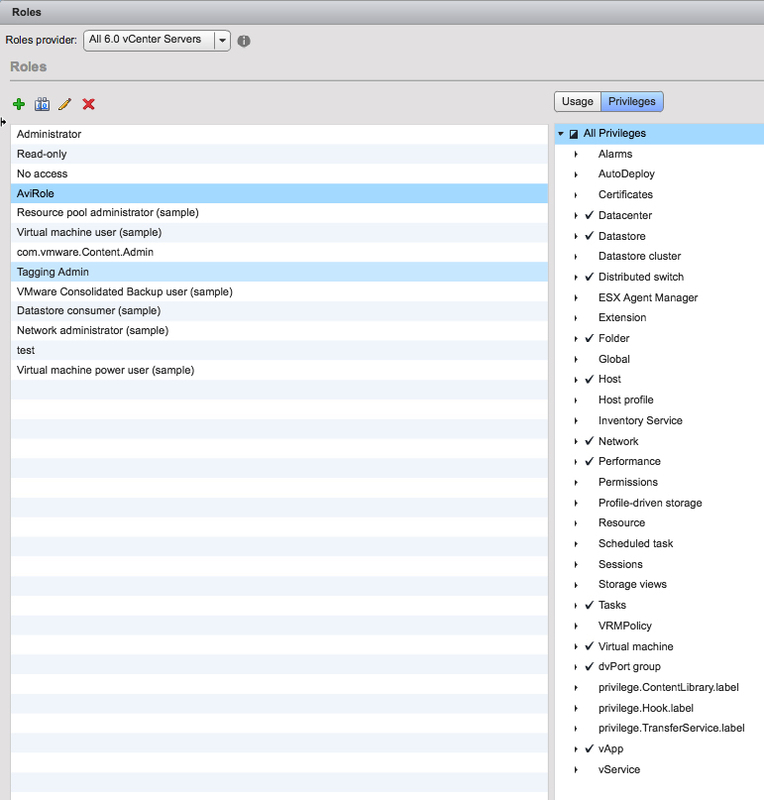 Prior to Avi Vantage 16.3, Service Engines deployed manually by the Avi administrator in No Orchestrator or VMware vCenter read access clouds required the user to download a unique copy of the Service Engine image for each cloud configured in the system. 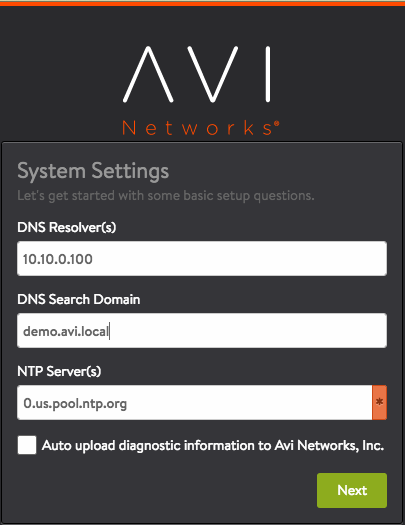 Starting with the 16.3 release, the Avi administrator needs to download only one Service Engine image for each type of image needed (ova/qcow2/docker). 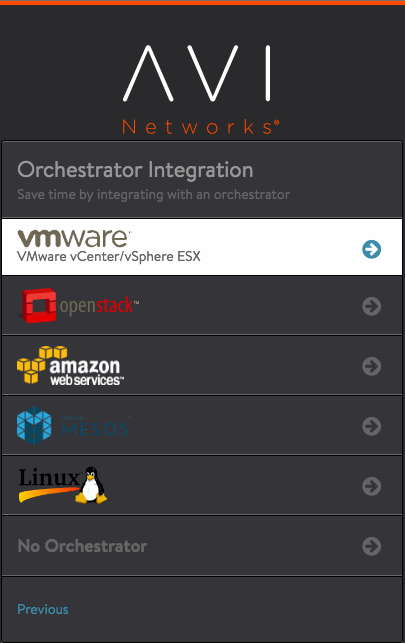 The same SE image can then be used to deploy SEs in any tenant and cloud configured in the system. Read this relevant article. The Avi administrator needs to download only one Service Engine image for each type of image needed (ova/qcow2/docker). The same SE image can then be used to deploy Service Engines in any tenant and cloud configured in the system. Read this relevant article. Appropriate physical resources need to be present in the ESX Host. If appropriate resources are not present in the ESX host, SE creation will fail and manual intervention will be required. RAM: Add 1 GB of RAM to the SE configuration for each additional vCPU. CPU socket affinity: If this option is selected, SEs within their group will have their vCPU cores allocation on the same CPU socket of a multi-socket CPU. Dedicated dispatcher CPU: If this option is selected, SEs within their group will dedicate a single CPU thread for dispatching data flows to other vCPU threads. This makes the most sense for SEs having three or more vCPUs. Disk: With 10 GB as an absolute minimum, set the disk value to at least (2 x RAM-size) + 5 GB. For more details on any of the above, read the Service Engine Group KB. 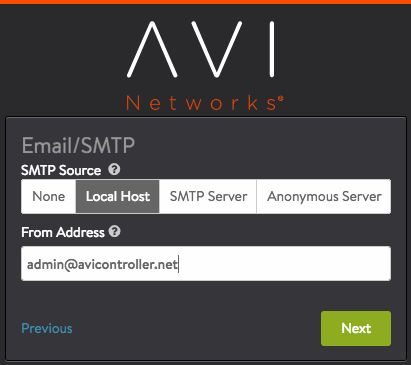 Write access mode: Avi Controller automatically spins up Avi SEs as needed, and accesses vCenter to discover information about networks and VMs. 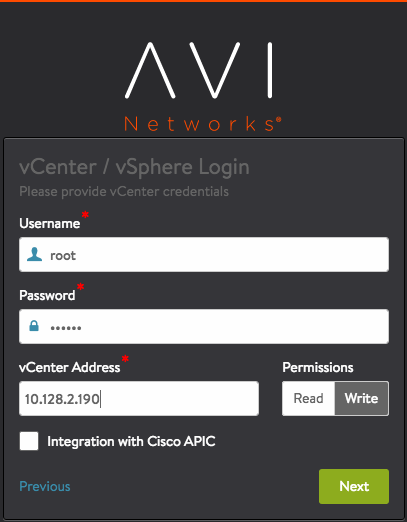 This mode requires a vCenter user account with write privileges. 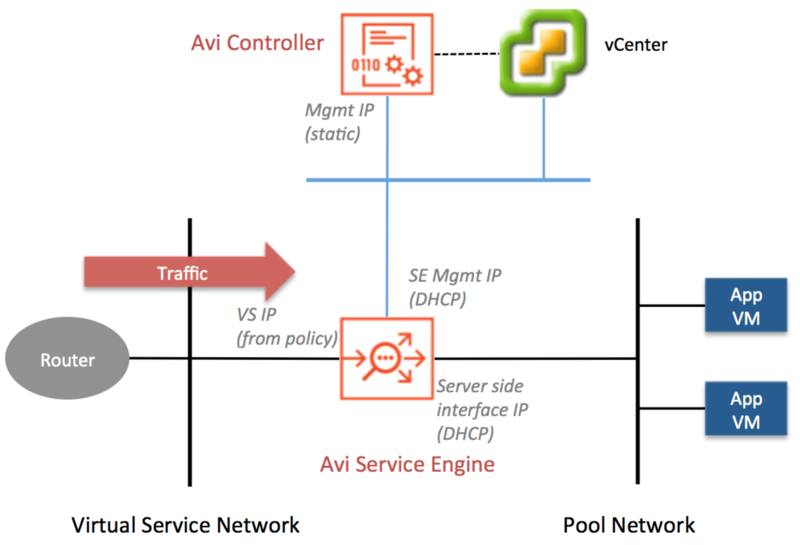 Read access mode: Avi Controller accesses vCenter to discover information about networks and VMs. 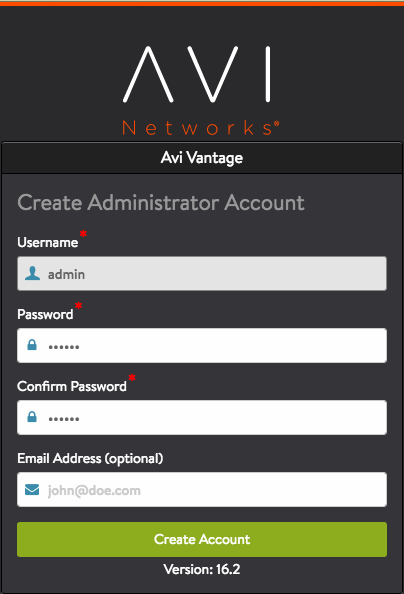 Avi SEs must be spun up and connected to networks by the Avi Vantage and the vCenter administrator (possibly you). 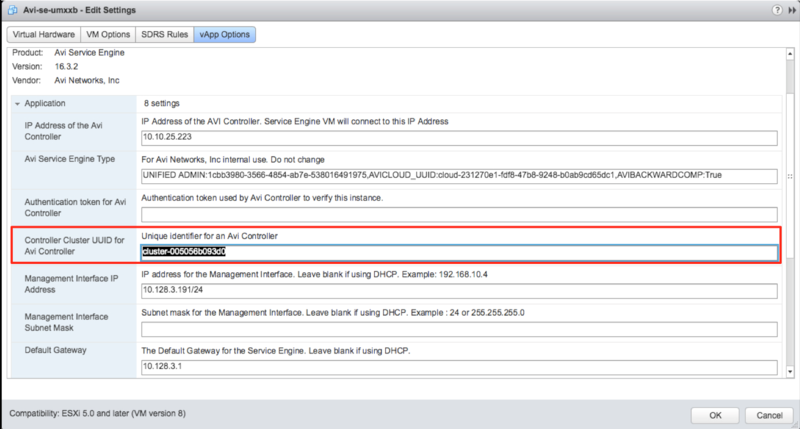 This mode requires a vCenter user account with read privileges. 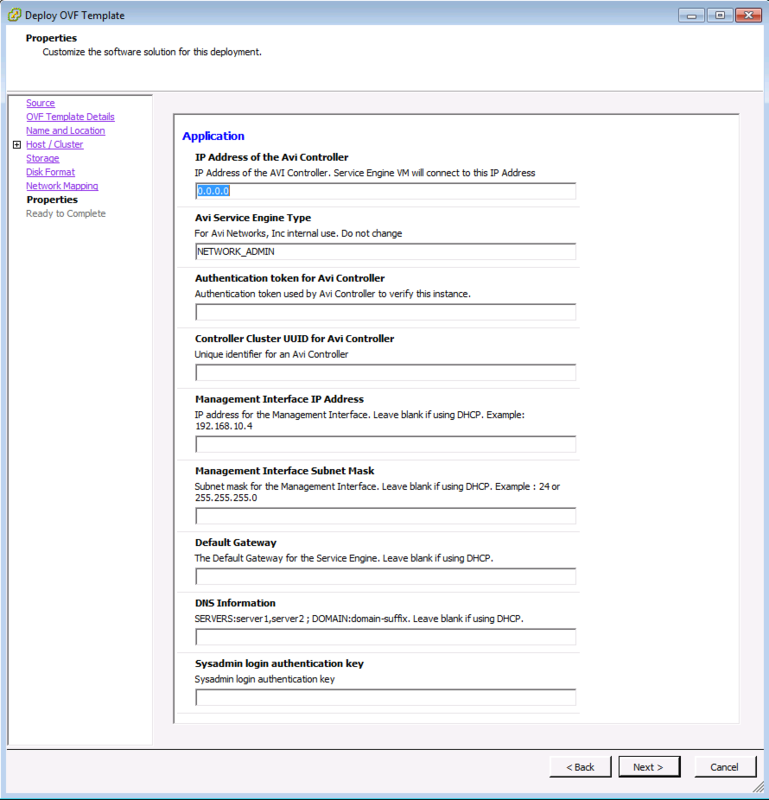 No access mode: Avi Controller does not access vCenter. 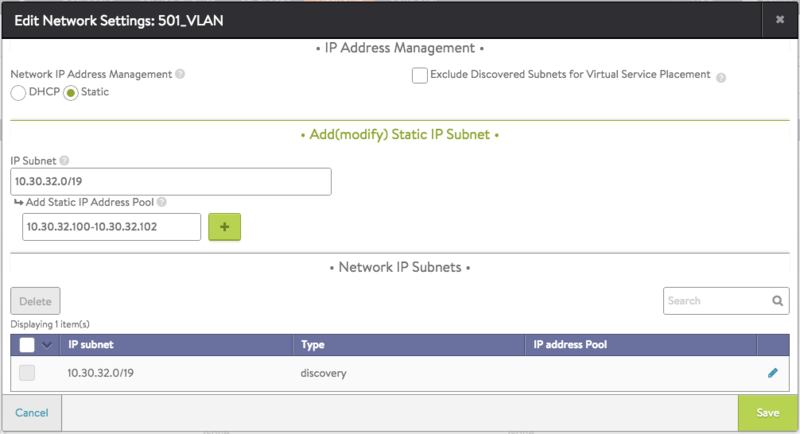 The Avi Vantage and vCenter administrator manually deploys Avi SEs, defines networks and interface IP addresses, and maps the Avi SEs to the correct networks. 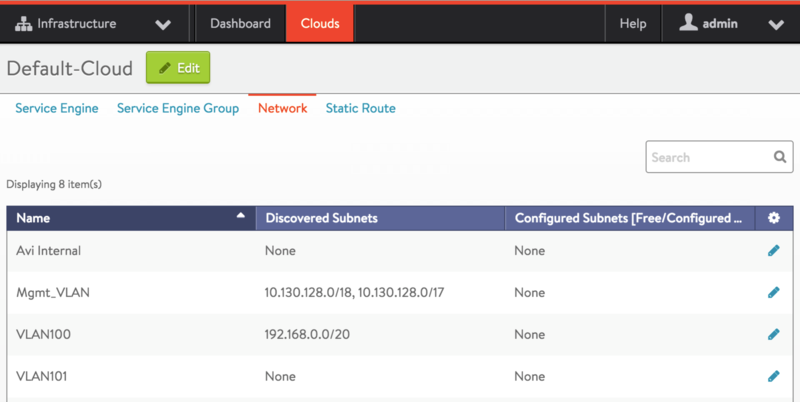 To verify installation, navigate to Infrastructure > Clouds, click Default-Clouds, then click the Status button. If the status is green, installation is a success. Example data from GET /api/cluster returns a cluster UUID of cluster-005056b093d0. 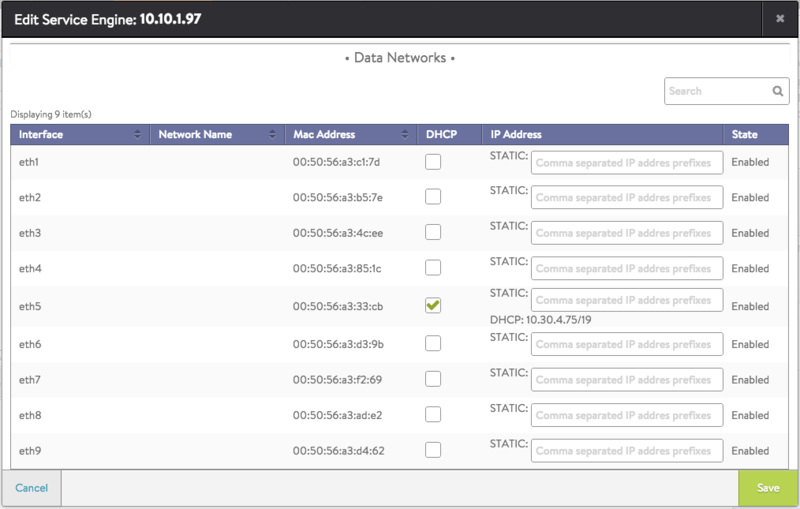 Note: In read access mode the Controller cluster UUID field needs to be filled in so that the Service Engine can connect to the correct Controller cluster. The field can be left blank in no access mode. 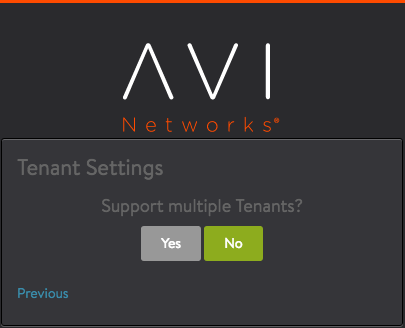 On the VM Properties menu, connect the Avi SE data vNICs to the port groups needed to reach a virtual service network and pool network. 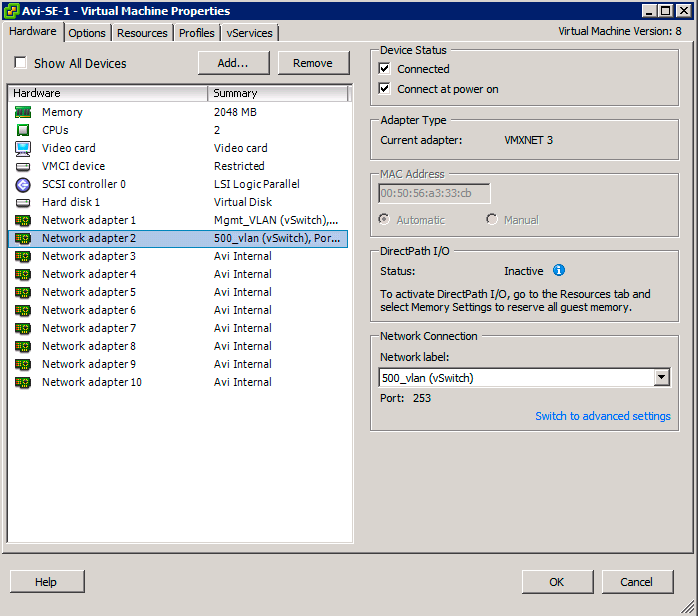 Note: Leave any unused vNICs disconnected.